St. Susanna Parish in Dedham has the unconventional holiday arrangement which includes baby Jesus inside a black metal cage. 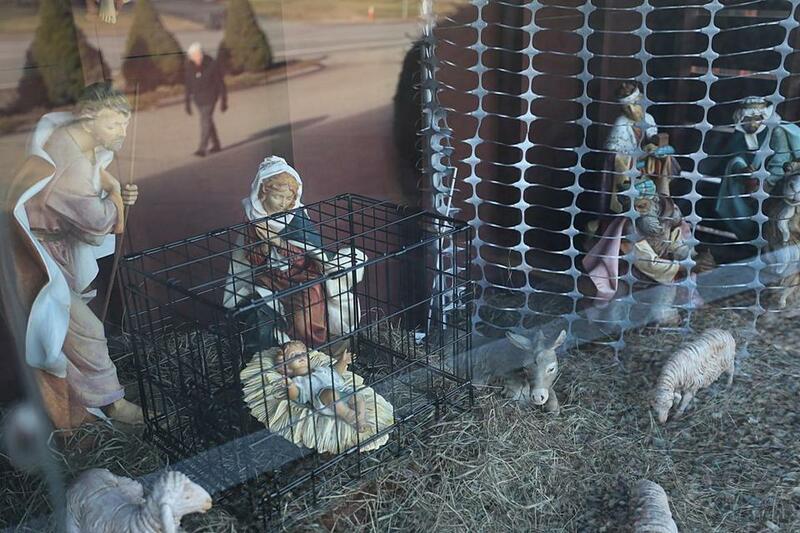 That’s the question displayed above a nativity scene in Dedham that features the baby Jesus inside a black metal cage and the three wise men cut off from Mary and Joseph by a fence-like barrier. The unconventional holiday arrangement outside of St. Susanna Parish was set up over the weekend to mark the start of Advent Sunday. But its purpose goes beyond that: Church officials and parishioners hope the imagery will provoke conversations about how immigrants are being treated at the US-Mexico border, including the controversial separation of children from their parents. “Is this what peace on earth looks like?” said Josoma, referencing recent events where tear gas was used by US agents to stop crowds of migrants — including children — from crossing the border. “It’s hard to say we are a people of peace when we are sending soldiers with tear gas to stop people,” he said. He said that so far, the display has been met with a mixed response — with some missing the point the church is trying to make. This is the second year that parishioners from the congregation have used the nativity scene to spark a thought-provoking conversation about current events. Last year, the display featured 16 signs posted on the back wall of the structure, each one bearing the name of a place where a mass shooting had occurred and the number of people who were killed.